Hurricane Sandy and her merger with a strong autumn storm system are making history along the U.S. eastern seaboard. But for a time earlier in her life, Sandy provided a bit of mystery to forecasters – showing why what you see in a satellite picture is not always what you get at the ground. Shown below are three infrared images of Sandy as she was approaching Cuba from October 24-25. What is the Saffir-Simpson Scale? Ever wonder what the difference is between a hurricane and a tropical storm? Or why there are five categories for hurricane intensity? In the early 1970’s, wind engineer Herb Saffir and meteorologist Bob Simpson wanted to develop a method for describing the effects of hurricanes in the Atlantic. They worked on creating a simple scale, ranging from 1-5, that highlighted the type of damage in the United States associated with hurricane intensity. The result was the Saffir-Simpson scale, and has been used by NOAA’s National Hurricane Center (NHC) since its inception. The original version of the Saffir-Simpson scale incorporated three different criteria. The first was the maximum sustained wind speed of the storm, more specifically, the average wind speed as sampled over a sixty-second period. This is done to remove wind gusts that may bias the result. The other two factors, central atmospheric pressure and storm surge, were once used to help factor the scale, but were removed in 2010. At that time, it was renamed the Saffir-Simpson Hurricane Wind Scale (SSHWS). Over the years, the Saffir-Simpson scale has been an excellent tool for alerting the public about the potential effects of a hurricane if it were to make landfall. In addition, there are two classifications below a category one hurricane that are key factors in determining cyclone strength. They are known as tropical depressions (TD) and tropical storms (TS). Similar to the Saffir-Simpson scale, these are also based upon the system’s wind speed. In the Atlantic, the TD’s have wind speeds less than 34 knots while the classification of a TS begins at 35 knots. You may also wonder why hurricanes can sometimes be called typhoons. That’s because different organizations have adopted their own methods for classification. The NHC, responsible for the North Atlantic and northeastern Pacific basin, is the only organization that uses the Saffir-Simpson scale. The Joint Typhoon Warning Center (JTWC) and Japan Meteorological Agency (JMA) have developed their own scale and call their strongest systems typhoons. In addition, weather centers in both India and Australia call their systems simply cyclones. It can be quite confusing at times to keep track! For more information about the Saffir-Simpson scale, check out the National Hurricane Center’s webpage here. Why do tropical cyclones have eyes? If you have been lucky enough while classifying storms on Cyclone Center, you have come across a tropical cyclone with an “eye”. 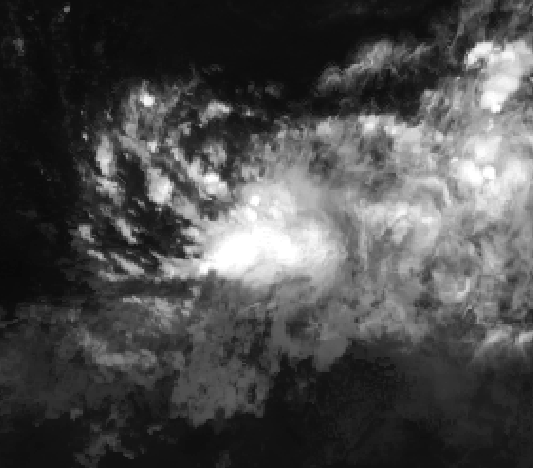 An eye, as shown in the image, appears in the center of the storm as a generally circular area of warm (low) clouds. The appearance of an eye usually means that the tropical cyclone has become very strong with winds exceeding 64 kt (74 miles per hour). But how does this nearly cloud free region form? 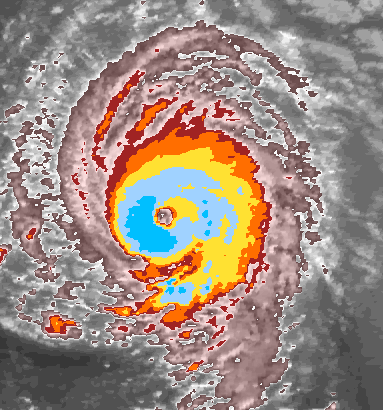 Hurricane Isabel (2003) showing off her well defined eye. The eyewall is the ring of blue clouds surrounding the eye. As we have mentioned in a previous post, a developing tropical cyclone features a lot of incoming warm, moist air that rises in around the center of the system. After a while all of that air “builds up” in the upper portions of the disturbance, creating a situation where the air begins to flow out and away from the storm. However, in stronger storms, some of the air flows in toward the center of the storm and begins to sink toward the ocean surface. When air sinks, it warms, leading to the evaporation (drying out) of clouds. This leaves a large cloud free area in the mid-upper portions of the middle – the proverbial “eye”. Eyes are the calling cards of mature tropical cyclones, which is why Cyclone Center asks you so many questions about them when you see them. Surrounding the eye is the eyewall, a ring of very cold clouds and an area that features the strongest winds of a tropical cyclone at the surface. Surface weather conditions in the eye are typically calm, with light winds and partly sunny skies. But as our ability to peer into the eyes of storms has increased, meteorologists are discovering that eyes are more complicated than we thought. Hurricane Isabel (2003) showed off what looks like a monster starfish in its eye. Hurricane Isabel (2003) appears to have a starfish in her eye! Seems very calm…but under those towering white clouds are winds in excess of 150 mph!! Head on over the Cyclone Center and help us find tropical cyclone eyes. Anyone who lives or vacations in the tropics knows that the weather is usually warm with gentle breezes and occasional thunderstorms. It seems surprising that these quaint conditions can turn into a ferocious storm that can potentially disrupt the lives of millions of people. How does this happen? It all begins with what meteorologists call a “tropical disturbance”, or a group of thunderstorms over warm tropical waters. As low-level winds flow into the disturbance, they evaporate water from the ocean surface. This process transfers energy from the ocean into the atmosphere. When the winds arrive at the disturbance, they rise up and release that energy into the air as they form clouds and precipitation. This warms the air and makes it buoyant, almost like a hot air balloon, and encourages more warm/moist air to flow in from the outside. As the air moves toward the center of the disturbance, it “curves” or “spirals”, rather than flowing in a straight line. This spiral effect comes from the rotation of the Earth – as air moves over large distances, the Earth moves underneath it, producing a spiral effect. Meteorologists call this the “Coriolis Effect”. The curved-band features that many of you see in the Cyclone Center images are curved because of this effect. For this reason, tropical cyclones cannot form near the Equator; the Coriolis Effect is too small there to provide the needed rotation. If the atmospheric and ocean conditions remain favorable, the energy brought in by the incoming air accumulates in the center of the disturbance, leading to a drop in atmospheric pressure. This in turn increases the speed of the wind and the incoming energy, which then leads to even larger drops in pressure. Once the winds speeds reach a certain threshold, a tropical cyclone is born. Interestingly, only about 7% of tropical disturbances form into tropical cyclones; the rest are destined to be absorbed into the warm tropical breezes, never to be named or remembered. The World Meteorological Organization (WMO) has assigned the task of forecasting tropical cyclones to different agencies in different regions. For instance, NOAA’s National Hurricane Center in Miami, FL, USA provides forecasts for the North Atlantic and Eastern Pacific. The Central Pacific Hurricane Center in Honolulu, Hawaii provides forecast for the Central Pacific. Several other countries have responsibility for providing forecasts in other regions (such as Japan, Australia, India, etc.). These same agencies that produce forecasts of tropical storms, also produce post season analysis of each storm’s position and intensity – which is called best track data. In addition to the WMO agencies, numerous other entities forecast and provide best track data. For instance, countries often provide the capability in their nation’s interest, such as China forecasting storms in the Western Pacific. The U.S. Joint Typhoon Warning Center (JTWC) provides forecasts for U.S. interests around the world. These agencies also provide best track data which overlap best track data from other agencies. However, there is not always complete agreement between organization on the strength of a given tropical cyclone. This is often due to different data available to each agency, different procedures in place for forecasting systems, personnel, etc. The data available to study, forecast and understand tropical cyclones has changed significantly through time and varies from agency to seo agency. Prior to the 1940s, the primary observations came from ships and land-based weather stations. Beginning in the 1940s, the U.S. military began testing – and later made operational – flights into Typhoons (in the West Pacific) and Hurricanes (in the North Atlantic). They found that these reconnaissance flights could be conducted safely and that they provided a wealth of information on the storm’s structure, intensity and environment. Routine aircraft reconnaissance in the Western Pacific ended in 1987 but still continues today in the North Atlantic. The satellite era was ushered in during the 1960s, providing more information on tropical cyclones. Numerous studies began relating cloud forms to intensity, which culminated in the Dvorak Technique in 1984. However, the availability and quality of satellite data varied, with some agencies still receiving imagery by fax in the 1990s. Similarly, newer satellites provide a wealth of information beyond imagery – microwave satellites provide information on storm structure, radar satellites observe precipitation and other satellites measure wind speed at the ocean’s surface. Again, different agencies have different levels of access to this data. The result is 1) best track data has changed in time as availability of data changes and 2) best track data varies between agency, due in part to access to different data and routine procedures. This means that differences occur in the best track record. More information on the WMO agencies is available here. More information on IBTrACS is available here. IBTrACS data can also be browsed online. Tropical cyclones have enormous impact on life and property around the world. These storms can destroy cities, economies and even armies. However, our ability to understand the strengths or even just to count the numbers of storms that have occurred globally or even in each ocean basin is limited by deficits in the historical data. For instance, there are studies in published literature that suggest that typhoon activity is both increasing and decreasing in the western Pacific Ocean. Clearly both cannot be true! Changing personnel, forecasting procedures, technological innovation and the introduction of new types of satellite data have created a record of past tropical storm information that is heterogeneous – that is, non-uniform. So looking at how the climatology or history of storms has changed over time is quite difficult and riddled with assumptions. For example, researchers interested in the number of tropical cyclones that have occurred each year throughout history have to make decisions about what years to begin or end their studies – the “period of record.” This choice can influence the results substantially. One possible choice is to choose a starting date as of when all recordkeeping began, say, 1851, ending in the present. This very long record would have a greater number of storms included but the data quality may not be as good as if the researcher made a different choice and started in the 1980’s satellite era. This alternative choice, limiting their years of interest to the time period when the entire globe has satellite observations would influence the number of storms included in the study. Before satellites, how would anyone know if a storm existed if it did not, in some way, impact humanity? Neither choice is “incorrect” but the assumption that is made clearly affects the results. Looking at the history of one storm at a time, even fairly recent storms have discrepancies in their historical records. For example, four forecast agencies were responsible for tracking Typhoon Yvette in 1992 – the Joint Typhoon Warning Center (US Navy), the Japan Meteorological Agency, the China Meteorological Administration, and the Hong Kong Observatory. These agencies have different methods and procedures for estimating the wind speed in tropical cyclones. The differences can be quite large. 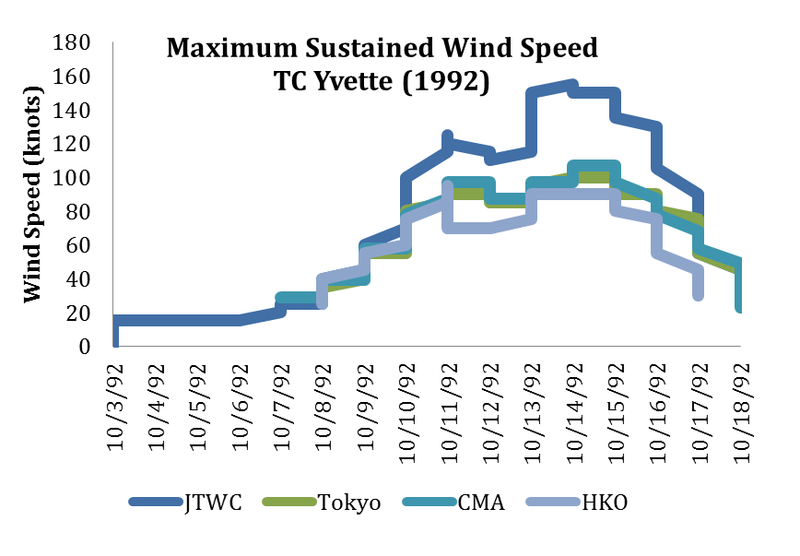 As shown in the graph below, on October 13th, 1992, the Joint Typhoon Warning Center estimated Yvette’s winds to be 155 knots while The Hong Kong Observatory estimated only 90 knots. This would be the difference between a Category 2 and Category 5 tropical cyclone on the Saffir-Simpson Hurricane Scale used in the United States. It isn’t clear what the best answer is for Yvette. Using group consensus, citizen scientists making storm strength estimates in CycloneCenter.org can help clear up this confusion. 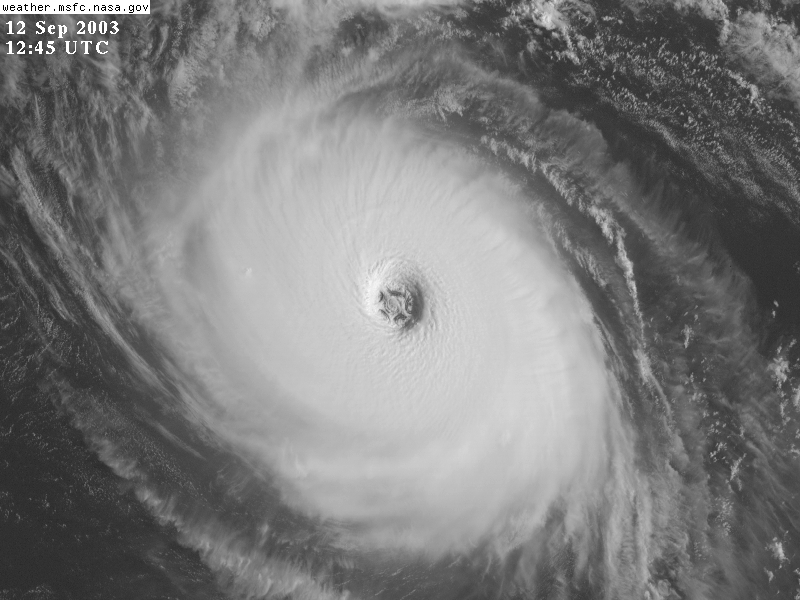 By participating in this endeavor, you and other citizen scientists are analyzing the satellite images through a process similar to the Dvorak Technique used by meteorologists, thereby providing a more consistent record of tropical cyclone strength. Your choices as you classify storms – your very mouse clicks – will lead to a better understanding of tropical cyclones. You never know, the statistics from the decision process you use to classify storms could even lead to further refinement of the intensity estimation process meteorologists use as well!